COLOR(S): All colors are approved of except white, grey, patches, black and tan or dappled. The Standard Poodle is a medium to large-sized dog, with a profuse, but well groomed and clipped, wiry curly coat. This is an active, intelligent and elegant appearing dog, squarely built, well-proportioned, moving soundly and carrying itself proudly. It still retains its ability as a gundog and is a very good swimmer. This dog is highly intelligent and eager to learn which makes it popular in obedience trails. This breed is steady, smart and loyal. This is a happy, good-tempered dog and makes an excellent family pet. There are three varieties of Poodle: Toy, Miniature, and Standard. 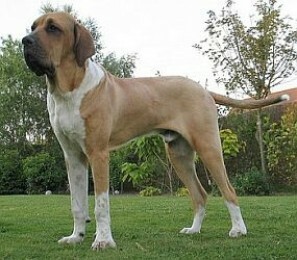 The three sizes are considered one breed and are judged by the same standard. Today, the Poodle is primarily a companion and show dog, though it can learn almost anything. The Standard Poodle is proud, elegant, dignified, gentle and good-natured. It is happy, pleasant, cheerful and sensitive. This breed is highly intelligent and is one of the most trainable breeds. The Standard Poodle tends to be a bit calmer than the smaller variety of Poodles. It needs close human companionship; it likes to be with people and dislikes being alone. The Standard Poodle is generally friendly toward strangers, and is excellent with children. It makes a good watchdog. Usually it gets along with other dogs. This dog enjoys a fair amount of exercise; it likes swimming and retrieving, walks or free run. Makes a great jogging partner. The Standard Poodle retains its sporting instincts, has great stamina, and needs more activity than the smaller varieties. Very profuse and dense, harsh texture, either curly or corded. Extensive grooming is needed. It must be bathed regularly and clipped every six to eight weeks. The traditional clips were developed to lighten the weight of the coat for swimming and protection to the joints and major organs from cold, but many owners opt for the plain lamb clip - the same length all over, because it is easier and more economical to maintain. This breed sheds little to no hair and is good for allergy sufferers. The Poodle's coat may be groomed into three basic styles: - the "pet clip" or puppy clip (under 12 months), with relatively short hair all over the body - the "English saddle" clip, - the "Continental" clip with the rear half of the body shaved, bracelets left around the ankles and pom-poms left on the tails and hips. All other clips are not admissible in shows. Hip dysplasia, stifle problems, Addison's disease, epilepsy, luxating patellas, PRA (Progressive Retinal Atrophy), renal disease, skin disorders, sebaceous adenitis, thyroid problems and bloat. Bloat is a health concern to most breeds, being the largest killer of dogs second only to cancer. It is also known as gastric torsion or twisted stomach. Standard Poodles enjoy a fair amount of exercise like swimming and retrieving, walks or free run. Makes a great jogging partner. Fairly easy to train as they are very intelligent and they learn quickly. The Standard requires the most coat care. Learning Rate: Very High. Poodles are highly intelligent and greatly enjoy performing. Obedience - Very High. Problem Solving - Very High. This is why the Poodle is so often chosen to perform in dog shows.